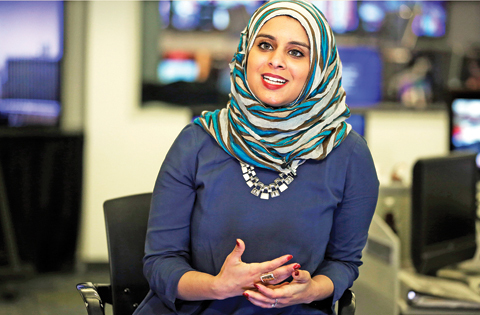 Rana Abdelhamid speaks during an interview in New York. When she was 16, Rana Abdelhamid was accosted on the streets of New York by a man who tried to pull off the head scarf she wears as a symbol of her commitment to her Muslim faith. Rather than withdraw, as she’d seen other Muslim women do, she turned her anger into a program that is now working with young Muslim women to teach them self-defense while encouraging them to become leaders and role models for others in their communities. Abdelhamid, a graduate of Vermont’s Middlebury College who is now a student at the Harvard Kennedy School of Government, says the challenge facing Muslims in general and Muslim women in particular has been getting worse, especially since the attacks in Paris and San Bernardino, California. “It’s unfortunate that it’s becoming more needed and we’re getting so many calls,” said Abdelhamid, 22, who grew up in the Queens borough of New York. Robina Niaz, the executive director of the group Turning Point for Women and Families, an organization that works to end domestic violence in New York’s Muslim community, said she first met Abdelhamid when she was in high school and participating in programs at the center. “Rana is a living example of what one can accomplish when we invest in these young girls,” Niaz said. “If we believe in them, if we support them, watch their back – they need just a little bit of nudging and mentoring and they are ready.” Muslim women in several cities across the country are organizing or taking self-defense classes, but Abdelhamid’s organization, the Women’s Initiative for Self-Empowerment, or WISE, goes beyond the physical self-defense skills to encourage the young women to become leaders and social entrepreneurs. The empowerment lessons can be as simple as showing the young women how to rent or reserve a room in a community center to tips on becoming a confident public speaker. Abdelhamid said her efforts have not been universally well received by the Muslim community. “We have had some challenges and pushback from more traditionalist members of our community who don’t necessarily see space for women in leadership, unfortunately,” she said. “It’s really, really disheartening because you want your allies to be within the community.” The program has grown since the first class was offered to about a dozen girls in the basement of a community center in Brooklyn. The basic program, called Mentee Muslimah (an Arabic word for Muslim women), is a 13-session summer camp attended in New York by about 50 young women of high-school age that follows a 100-page course outline Abdelhamid developed during an independent study course at Middlebury. The organization relies heavily on donated space and volunteers, but it’s also received donations and in some cases fees are charged to people taking the program to help defray expenses. She’s in the process of setting up a formal non-profit group so WISE can have a permanent home and a budget. Abdelhamid sometimes travels to lead programs outside New York, but most are led by people who have taken the program and then been trained to teach it. The summer programs outside New York are held in Union City, New Jersey, Washington, Dallas, Madrid, and Edinburg, Scotland. She’s working on setting up programs in Chicago, Dublin and Istanbul. Next month WISE also is planning a three-day program in Boston for Jewish women. Nitasha Siddique, a 19-year-old student at Princeton, said she got involved with WISE after her junior year in high school when she was accepted into the New York summer programs.